First day: Visit to the farms of Sneumgaard Simmental, Klostergaarden Simmental , Katrinelund Simmental (with Östervang Thor as herd bull). Second day: We spent the whole day at the Landsskuet in Herning with the national show. In the evening we have been invited to the official dinner. 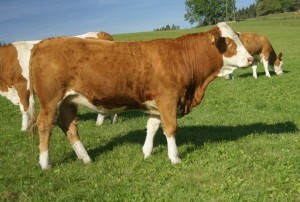 The quality of the Simmentals was amazing. 4th day: Visit to the Herd of Rosa and Anders Langkjaer and Aksel Harpoth. The afternoon we spent in Ribe, one of the oldest cities in Denmark. Thanks a lot to Jens Jermiin Nielsen and Henning Hansen for planning our trip. And of course to all the breeders who show us their farms and animals!